Hello, and thank you for joining me (Claire N) again. I am hoping that you enjoyed my last post where I introduced new crafters and cardmakers to a basic list of supplies to get started. Here is a quick recap of that list. Challenge myself, and encourage and spur on seasoned crafter's to use up scraps and supplies that have been pushed towards the back of the draw. So today I have used standard white 6x4 inch card blanks, the sentiment stamp set (from last post), the black ink pad and scraps of the free downloadable dotty paper printed last month. Picnic in the Park stamp set by Sarah Hurley - this is a fantastic set to treat yourself to and offers you lots of opportunities to make cards for all occasions and techniques. Cut a piece of white cardstock to 5.5 x 3.5 inch and draw two feint parallel lines in pencil, between which you can pencil in the word 'hello'. 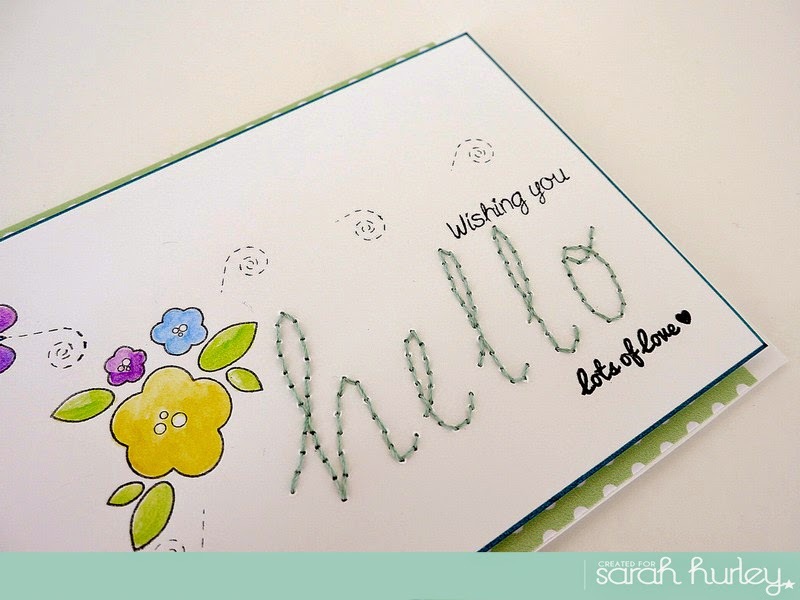 For those who enjoy stitching, you can take your needle and thread now and stitch the word 'hello' - using the needle to prick the holes first. If you are not a stitcher, I have also made an alternative card for you, showing you that faux stitching with a marker pen is as effective. Stamp the flower and leaf stamp, from the newly introduced set, and stamp with the black ink. Stamp also the butterfly with the twirly trail. TIP 1- ink the stamp with the black ink and stamp once on scrap paper, before stamping on the card. This just takes away the intensity of the black. TIP 2 - Look at elements of individual stamps too. To embellish card, ink JUST the twirly trail and stamp randomly over the card. Colour the stamped images with the coloured pencils. If you have watercolour pencil, you can use a barely damp paintbrush to blend the colour too. TO chow the comparison, I have watercoloured the stitched card. I actually quite like the look of the untouched pencil colour. Stamp the sentiments in black. Using a ruler,the same marker you traced the letters with, draw a thin border around the outside edge. 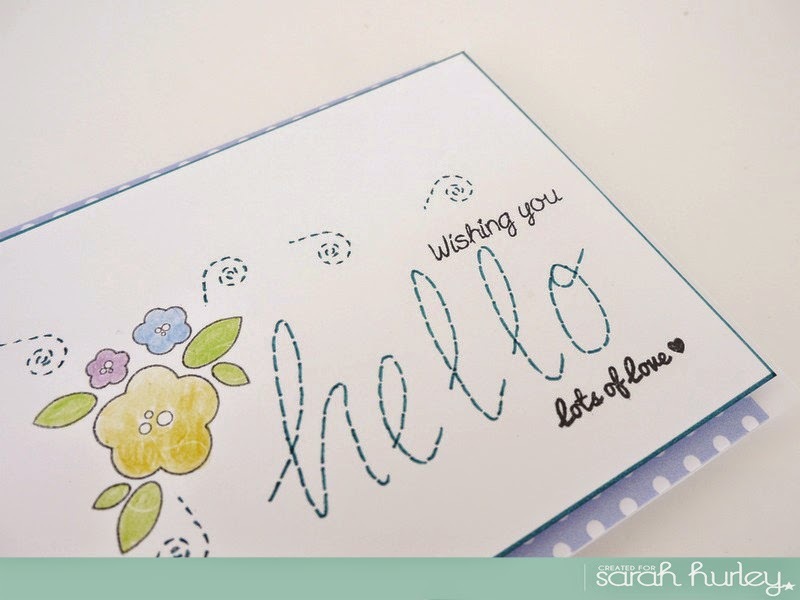 Using double sided tape, add a layer of dotty paper direct to the card blank, before adding the stamped layer. Thank you so much for joining me today, I do hope I have given you a few ideas, and shown you that you don't (initially) need bundles of supplies to make pretty cards with lovely sentiments. If you are new to the craft, we would love to see what you have made. Oh my goodness this is gorgeous and simple. I think most of us need to be able to create such beautiful cards on a budget. it has been really refreshing to get back to the basics of cardmaking again.....I really enjoyed making these.